Issue 3 of SRSP‑303.7 has been released to incorporate refinements to the minimum antenna characteristics and emission limits. This SRSP replaces SRSP‑303.7, Issue 2. 1.1 This Standard Radio System Plan (SRSP) states the minimum technical requirements for the efficient use of the band 3700‑4200 MHz by high‑capacity (HC), point‑to‑point radio systems in the fixed service using digital modulation. 1.2 This SRSP is intended to be employed in the design and specification of radio systems and equipment and in the technical evaluation of applications for new radio facilities or modification to radio systems submitted in accordance with the current issue of Radio Standards Procedure 113, Application Procedures for Planned Radio Stations Above 960 MHz in the Fixed Service (RSP‑113). 2.1 This Standard replaces SRSP‑303.7, Issue 2. Further revision of this SRSP will be made as required. 2.2 Existing point‑to‑point radio systems operating in the band 3700‑4200 MHz and licensed as standard prior to the issuance of this SRSP may continue to operate as standardFootnote 1. Extension and/or expansion of these systems will be considered by the Department on a case‑by‑case basis. New stand‑alone radio routes must conform to the requirements of this Standard. 2.3 Radio systems conforming to these technical requirements will be given priority in licensing over non‑standard radio systems operating in this band. 2.4 The arrangements for non‑standard systems are outlined in SP Gen, General Information Related to Spectrum Utilization and Radio Systems Policies . 2.5 The Geographical Differences Policy (GDP) guideline applies in this frequency band. More information on the GDP can be found in SP 1–20 GHzFootnote 2. 2.9 The use of a two‑frequency plan is required. Where reasonable economic or technical justification is provided (e.g. where siting prevents adequate antenna discrimination), extra frequencies may be used to resolve the problem, subject to the provisions of Section 2.5. 2.10 It should be noted that the fixed service shares this band equally on the basis of primary status, with the fixed‑satellite service (space‑to‑Earth). The current issues of the following documents are applicable and available on the Spectrum Management and Telecommunications website at: http://www.ic.gc.ca/spectrum . The radio frequency channel arrangements defined in this Standard provide for 20 MHz, 30 MHz and 40 MHz RF channel bandwidths. In order to minimize intermodulation effects, each set of RF channel bandwidths will operate with its own transmit/receive separation. 4.2.1 The centre frequencies of the channel allocations for radio systems using 20 MHz channels with transmit/receive separations of 250 MHz are shown in Table 1. 4.2.2 The centre frequencies of the channel allocations for radio systems using 30 MHz channels with transmit/receive separations of 255 MHz are shown in Table 2. 4.2.3 The centre frequencies of the alternate channel allocations for radio systems using 40 MHz channels with transmit/receive separations of 260 MHz are shown in Table 3. The frequencies assigned to a main route system should be re‑used where possible on the branching or spur routes. The siting of repeater stations should be planned with this requirement in mind, in order that sufficient antenna discrimination is obtained at the branch‑off angle. Note: Airborne radio altimeters in the aeronautical radionavigation service operating on frequencies just above the band edge at 4200 MHz may cause sporadic adjacent channel interference to radio systems operating on 4180 MHz. Assignments in this band should use the lowest available frequency pair that can be successfully coordinated. Systems submitted for licensing must have the capability of achieving a spectral efficiency of at least 4.4 bits/second/Hz of RF channel bandwidth on a single polarization. 4.7.2 Quad‑path diversity applications will be considered on a case‑by‑case basis to solve special propagation problems. 5.1 The transmitter power delivered to the antenna input should not exceed 10 watts per RF channel. 5.2 An increase in transmitter power over the above‑specified limits may be permitted if technical justification is provided. In no event shall the power delivered to the antenna be permitted to exceed 20 watts (+13 dBW) per RF channel. 6.1 The co‑polarized radiation pattern envelope in the horizontal plane of the antenna must remain within Envelope A defined in Table 4 and shown in Figure 1, for both vertical and horizontal polarizations. 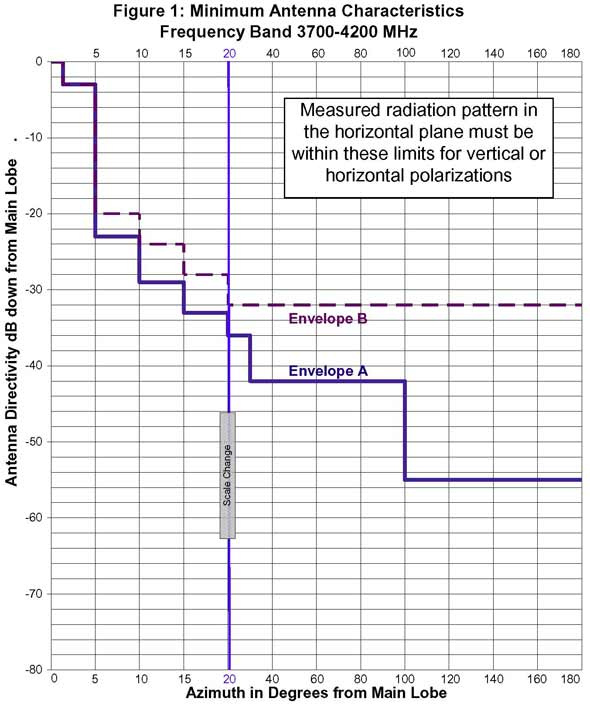 6.2 In uncongested areas, the co‑polarized radiation pattern envelope in the horizontal plane of the antenna must remain within Envelope B defined in Table 4 and shown in Figure 1, for both vertical and horizontal polarizations. The previous RF channel arrangement for the 4 GHz band (3500‑4200 MHz) is shown in Appendix 1. Existing point‑to‑point systems operating in accordance with Appendix 1 in the band 3500‑3650 MHz are subject to the transition arrangements found in Policy and Licensing Procedures for the Auction of Spectrum Licences in the 2300 MHz and 3500 MHz Bands . Existing point‑to‑point systems operating in the band 3650‑3700 MHz may continue to operate, pending a future spectrum policy review. Spectrum Utilization Policy 1‑20 GHz, Revisions to Microwave Spectrum Utilization Policies in the Range of 1‑20 GHz (SP 1‑20 GHz), January 1995, contains spectrum utilization principles including the Geographical Differences Policy guideline. This information will be incorporated into a revision of SP Gen.
For the purposes of this SRSP, "harmful interference" means interference that endangers the functioning of a radionavigation service or other safety services or seriously degrades, obstructs, or repeatedly interrupts a radiocommunication service operating in accordance with regulations and technical requirements laid down by Industry Canada under the Radiocommunication Act . - 142 dB (W/m2) in any 4 kHz band for angles of arrival between 25 and 90 degrees above the horizontal plane. ITU-R Recommendation SF.765 provides guidance on calculating the intersection of radio‑relay antenna beams with orbits used by space stations in the fixed‑satellite service.